A statement from the TORONTO EDUCATION WORKERS: Reading through the Report on the TDSB, produced by Margaret Wilson and the January 15th, 2015 “13 Points” response letter from the Minister of Education Liz Sandals, a number of serious issues crystalized. * the representatives of the almost 40,000 unionized staff (including teachers and education workers). This critical gap says everything. The people who directly depend on public education, those who foot the bill and those who work in the system (lower ranks, of course) are just not important. The Wilson Report is produced by still another consultant to the Minister of Education by a person whose expertise is not governance, democratic procedures nor how democratically elected bodies function. The Report and the Minister’s 13 Points contain relatively few suggestions that will “solve” relationship issues and imposes unreasonably tight timelines. This makes it very difficult for the newly-elected Board to find out the background on many of the issues, particularly what is going on with the so-called “empty classrooms and schools” or to gather a sense of why the neighbours and local city representatives are concerned about the loss of local assets and what can be done to preserve these “hubs of the communities”. It is not an accident that this little surprise is sprung within weeks of the installation of the newly elected Board, fully 50% of whom are new and, generally, progressive. The most important goal of these “reforms” is to strip the last vestiges of power from the Trustees, make meaningful consultation impossible and get Trustees out of the way so that the Board’s valuable real estate can get in the hands of the developers faster. This goes well with the Provinces recently released policy to fast-track (by more than 50%) the process of getting lands and buildings up for sale. The “13 Points” also reverse some democratic reforms that have taken parents decades to achieve. Here is one thing that all previous supervisors came to understand: the Toronto District School Board has a major sector of workers and community members – with or without children in the system – who value the good work which is done and who will struggle for a good quality, well-funded, democratically controlled educational system. They reject the model of depending almost solely on implementing changes originating elsewhere which, in the estimation of people who are closest to the system, neither assist the achievement of school age learners nor that of the adults, seniors and young children who also are a part of our “life-long learning” educational system. Many of the changes imposed to the system in the last 17 years have or will actively harm it. Fighting to protect an institution that is so valuable to our society as a whole is not inappropriate, a privilege, nor fool’s quest. Having Trustees who support a similar vision of education is the logical outcome of years of struggle. The amalgamation of the school boards in Ontario were a product of the slash and burn politics of the Mike Harris Progressive Conservatives and his successors. It had nothing to do with education. It had everything to do with defunding. Frills like music, pools, green spaces, outdoor education centres, staffing sufficient to keep schools clean, support special needs children and helping parents to understand and participate in their child/ren’s education were to be eliminated (as just a few examples). The fight to “Give Students What They Need to Succeed” was a direct response on the way and amount money was allocated. The fight united communities with parents and with teachers and education workers. When the Trustees stood up to the Harris Provincial government and refused to cut any more classes, programs and staff, they were put under Supervision for the first time. Significantly, even with the power of the majority Provincial Tory government, Supervisor Paul Christie could not bring the budget in as was desired. Only one small group, the Community Liaison / School Community Advisors, were actually eliminated, and they were brought back just a few years later with different job titles but much the same mandate. That experience of Supervision was probably the best evidence that the drive to shrink the system was not only wildly unpopular, but actually unachievable. The subsequent enforcement of Supervision on a number of larger public and Catholic Boards of Education reinforced that conclusion. Unfortunately, the targeted boards did not choose to stand together and support one another, much to the detriment of all. Individual Liberals, including now-Premier Kathleen Wynne who headed up an influential parent organization, prior to being elected Trustee and then MPP, were either a part of the Need to Succeed” Fightback in Toronto or worked independently but in tandem. The Provincial Tories were damaged, and, in the next election, the McGuinty Liberals promised to make several key reforms, not the least of which was to dump the funding formula that was designed to strip out assets from the Boards. Needless to say, we are still waiting. . .
Our education system belongs to the people of Toronto and governance is entrusted to their elected representatives on the school board. As large as the TDSB is, it is still far smaller and easier to access than the mega-“Board” created by the Province which is micro-managing budgets, curriculum and negotiations with the employees at every single Catholic and Public School Board and each and every school in the Province. That, by definition, is not only undemocratic but is dysfunctional. 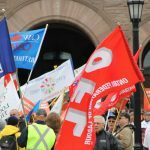 The chaos brought about by amalgamation, downsizing and the loss of valued employees and programs, 5 directors, several Supervisors and 17 years of financially starving the system will not be solved by this most recent attempt because root causes are neither examined nor are the basis for much needed, genuine reform. Those of us who have been trying to protect the world-renowned Toronto public education system for (at least) the last 17 years, and those who recognize the necessity of fighting for financial stability, utilizing our resources to better the life of our various communities (including the creation of “hubs”) and who support real curriculum reform (well beyond “The Test”) have developed a short but very comprehensive list that would go a long way to protect, renew and restore … plus give all students what they need to succeed. Go to www.campaignforpubliceducation.ca and click on “Education Matters” for your copy.